In an unprecedented declaration, Prime Minister Shinzo Abe said Wednesday he hopes to see a revised Constitution take effect in 2020, revealing the clearest goal yet of his long-held ambition to amend the national charter, which has remained untouched since its inception seven decades ago. Abe’s statement came as the nation marked the 70th anniversary of the enforcement of its pacifist Constitution, which was drafted by the Allied forces after Japan’s defeat in World War II. “2020 is the year when a new Japan will kick off, and I strongly hope the year will see the new Constitution come into force,” he said in a video message shown at an event in Tokyo’s Nagatacho, the political heart of the country. Abe’s mention of the timeline suggests he believes he will be re-elected in his party presidential election slated for next year and remain in power through 2021. Abe also proposed that the revised Constitution clearly mention the presence of the Self-Defense Forces, saying that even after 70 years, the supreme code still makes no acknowledgement of the SDF, despite the high degree of public trust it enjoys today. “We need to make sure, at least within our generation, that the argument that ‘the SDF may be unconstitutional’ will no longer be made,” he said. The anniversary coincided with a growing sense of urgency stemming from a recent string of missile launches by North Korea, giving renewed momentum to backers of a constitutional amendment, including Abe. They have long maintained that the current Constitution leaves the SDF undefined, therefore minimizing the nation’s military capability. On Saturday, Pyongyang went ahead with yet another, although failed, test-firing of a ballistic missile in its latest defiance of U.N. Security Council resolutions. 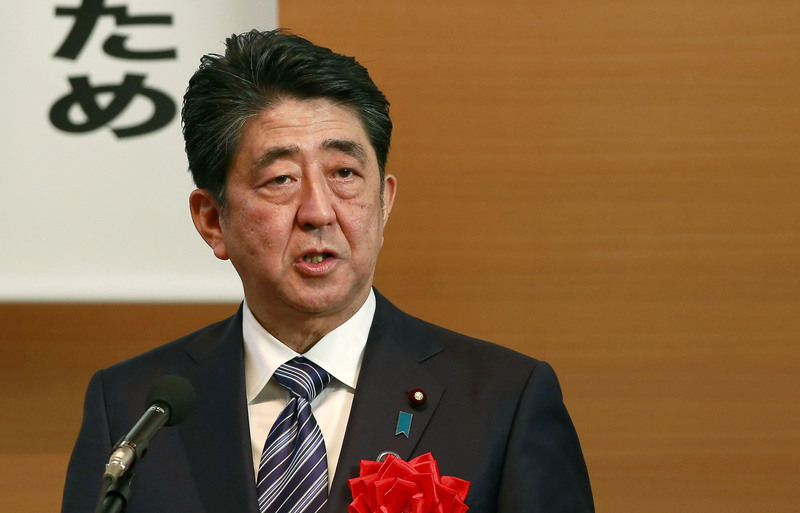 In changing the charter, however, the war-renouncing Article 9 should be upheld, Abe stressed. A mention of the SDF would not interfere with that pivotal clause, he said. In the video message, Abe also signaled his willingness to have the Constitution newly stipulate that children be granted free access to higher education, stressing the need for eradicating child poverty. Abe’s comments came after he had promised at a Tokyo event on Monday to take a “historic” step toward the goal of revising the supreme law this year. Thanks to a resounding victory in last July’s Upper House election, Abe’s ruling coalition and other pro-revision forces now control a two-thirds majority in both chambers of the Diet, which would allow him to call a national referendum on revising the Constitution for the first time ever. In April 2012, Abe’s ruling Liberal Democratic Party unveiled its own draft constitution, only to draw fierce criticism by some that it was too conservative and militaristic. 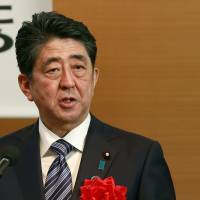 At the Monday event, Abe reiterated the LDP’s stance that it will refrain from submitting the draft to a Diet panel tasked with studying revisions to the Constitution. The LDP’s leadership fears that doing so will antagonize opposition parties to such an extent that discussions on the revisions would stall. In Tokyo and elsewhere across the country on Wednesday, opponents of Abe’s ambition to revise the charter held protest rallies. 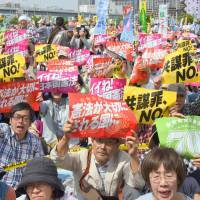 In Tokyo’s Ariake district, the organizers of three civil groups estimated 55,000 people turned out for their rally. Invited to the protest were leaders of opposition parties including the Democratic Party, the Japanese Communist Party and the Social Democratic Party. Kazuo Shii, chairman of the JCP, criticized Abe’s decision to use the SDF as a way to respond to threats from North Korea, calling it a sign that Japan is being “subordinate” to the U.S. Last month, the Maritime Self-Defense Force began joint drills with the aircraft carrier USS Carl Vinson amid concerns over the North’s missile tests. He was referring to a set of security laws that — based on the Abe Cabinet’s reinterpretation of the Constitution — significantly expanded the scope of overseas operations of the SDF. Abe’s push for revising the charter has left his political foes like Shii and anti-war activists fighting an uphill battle for its preservation, especially Article 9, which they argue has played a pivotal role in steering the nation away from war for the last 70 years. They are also concerned that momentum for their antiwar effort has somewhat fizzled out, after it peaked two years ago with the enactment of the security legislation. During a rally in front of the Diet building on Friday night, Yukino Baba, a 20-year-old student and founding member of protest group Mirai no Tame no Kokyo (Public for the Future), said that the number of like-minded protesters and groups is nowhere near the level seen in 2015. The group was formed in March by former members of SEALDs, short for Students Emergency Action for Liberal Democracy, among others. 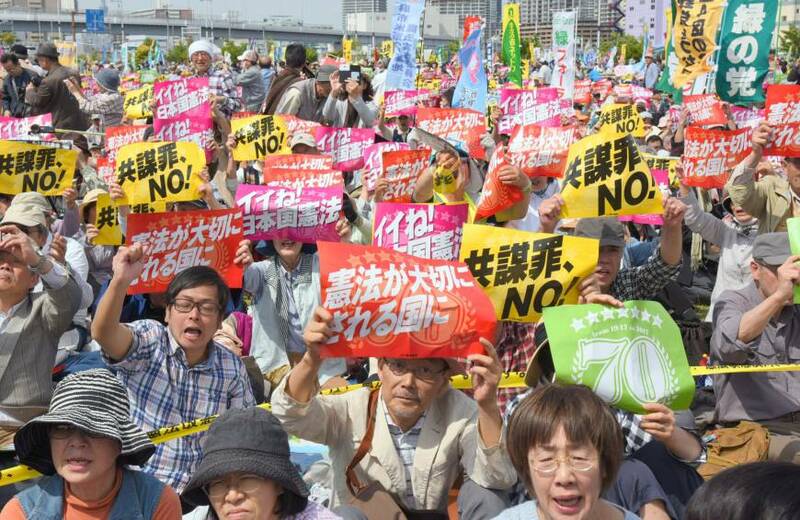 Recent opinion polls conducted by public broadcaster NHK and Kyodo News show that many in the public favor a constitutional revision, with supporters at 43 percent and 60 percent, respectively, versus the 34 percent and 37 percent opposed. Of the 2,643 respondents to the survey, which was conducted on a face-to-face basis in March, 93 percent said they felt threatened by nuclear and missile tests by Pyongyang.